I’ve made Mounds Bar Cookies, twice, and Mounds Bar Brownies. It’s time to show some love for Almond Joy. Are you a Mounds Bar or an Almond Joy person? I’m both. If you can relate, you’re going to love the cookies. They’re some of the best cookies I’ve made in a long time and actually took me by surprise. After my first bite I was like, whoa, these are amazing. Love happy surprises. 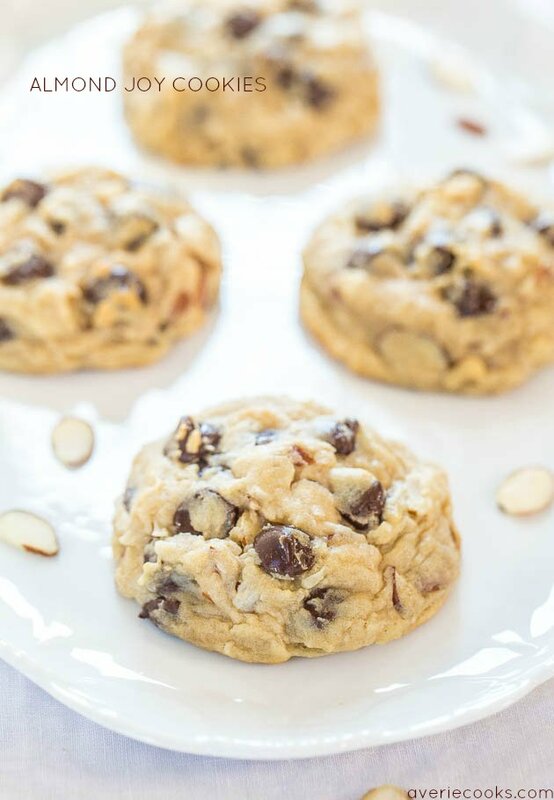 They’re soft, ultra chewy, and loaded with amazing texture and so much almond-coconut flavor. The crunchy and buttery slivered almonds, the sweetened shredded coconut, and plenty of chocolate make the cookies so satisfying. I used Fisher Natural Sliced Almonds which are perfect for baking because they don’t contain added salt. I used both almond and coconut extracts to boost and intensify those flavor profiles. 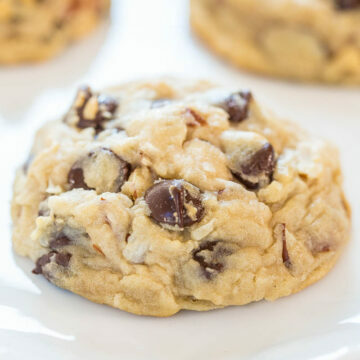 I love baking with almond extract and in the cookies, it’s the more pronounced of the two extracts. They’re sold in the baking aisle near vanilla extract and while you could use vanilla extract, I recommend making the recipe as written. The recipe makes a baker’s dozen, which is perfect if you don’t need a huge batch of these tempting little morsels laying around, but you can easily double it if you do for cookie exchanges or holiday parties. 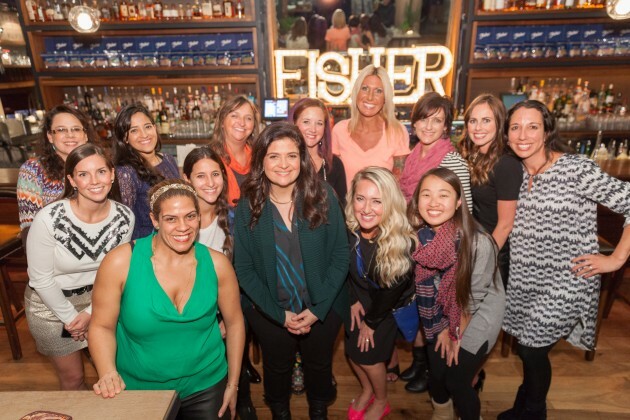 I was recently in New York City on a trip sponsored by Fisher with a dozen other bloggers. While there we attended a cooking demo that Chef Alex Guarnaschelli hosted at her restaurant, Butter. I’ve always loved watching her on Chopped and Iron Chef and it was so fun to meet her and watch her cook. It was a fast, whirlwind trip and then I came home and made cookies. 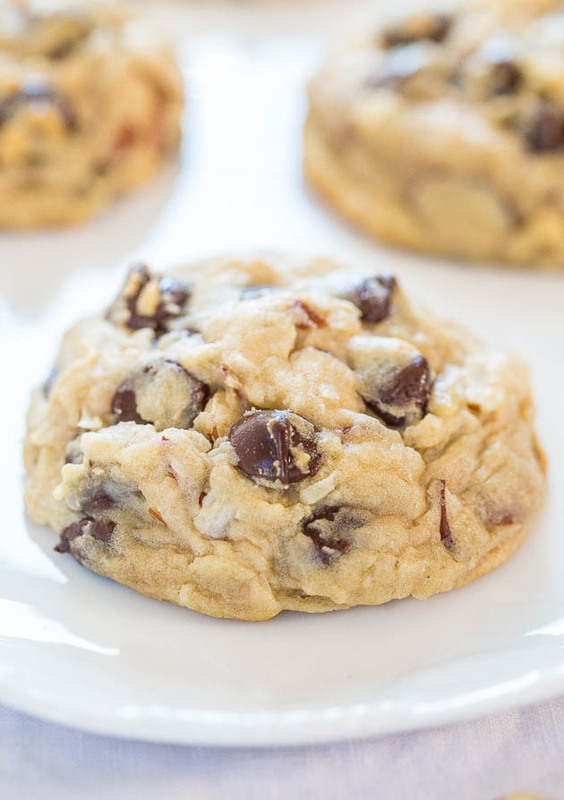 The cookies are soft, ultra chewy, and loaded with amazing texture and so much almond-coconut flavor. The crunchy and buttery slivered almonds, the sweetened shredded coconut, and plenty of chocolate make the cookies so satisfying. I used both almond and coconut extracts in the dough to boost and intensify those flavor profiles. They’re sold in the baking aisle near vanilla extract and I highly recommend using them. The recipe makes a baker’s dozen, which is perfect if you don’t need a huge batch of these tempting little morsels laying around, but you can easily double it if you do. To the bowl of a stand mixer fitted with the paddle attachment (or large mixing bowl and electric mixer) combine the butter, sugars, egg, extracts, and beat on medium-high speed until creamed and well combined, about 4 minutes. Stop, scrape down the sides of the bowl, and add the coconut, almonds, chocolate chips, and beat on low speed until just combined, about 30 seconds. Using a large cookie scoop, 1/4-cup measure, or your hands, form approximately 13 equal-sized mounds of dough, roll into balls, and flatten slightly. 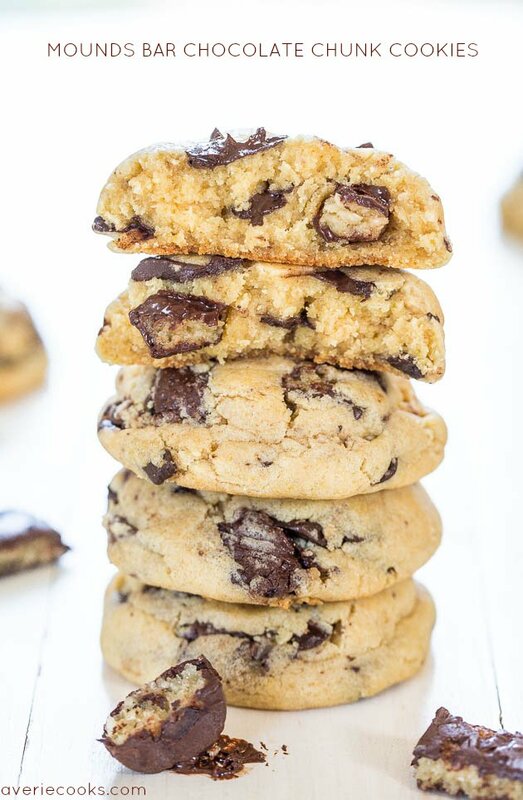 Tip – Strategically chocolate chips on top of each mound by taking chips from the underside and adding them on top. Preheat oven to 350F, line a baking sheet with a Silpat or spray with cooking spray. Place dough mounds on baking sheet, spaced at least 2 inches apart (I bake 8 cookies per sheet) and bake for about 10 to 11 minutes (I baked for just under 11 minutes), or until edges have set and tops are just set, even if slightly undercooked, pale, and glossy in the center; don’t overbake. 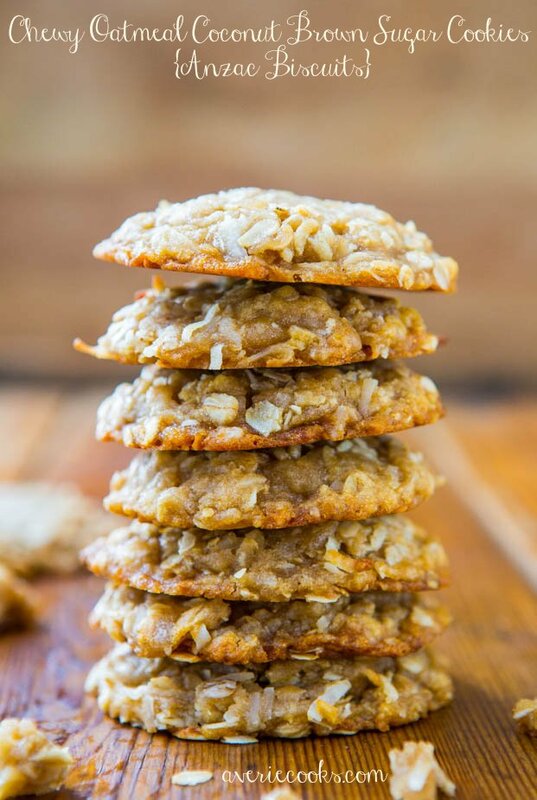 Coconut is prone to burning and undersides of cookies can easily become too dark so watch them closely. Cookies will be pale and look un-done, but firm up as they cool. Allow cookies to cool on baking sheet for about 10 minutes before serving. I let them cool on the baking sheet and don’t use a rack. 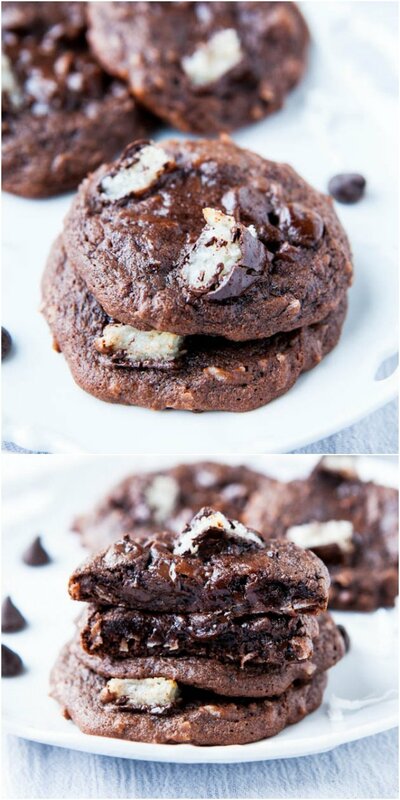 Mounds Bar Chocolate Chunk Cookies – Soft, chewy and stuffed to the max with dark chocolate and Mounds! Mounds Bar Chocolate Coconut Cookies – Hunks of Mounds candy bars are baked into rich, extra-chocolaty cookies! Fast, easy & foolproof recipe! 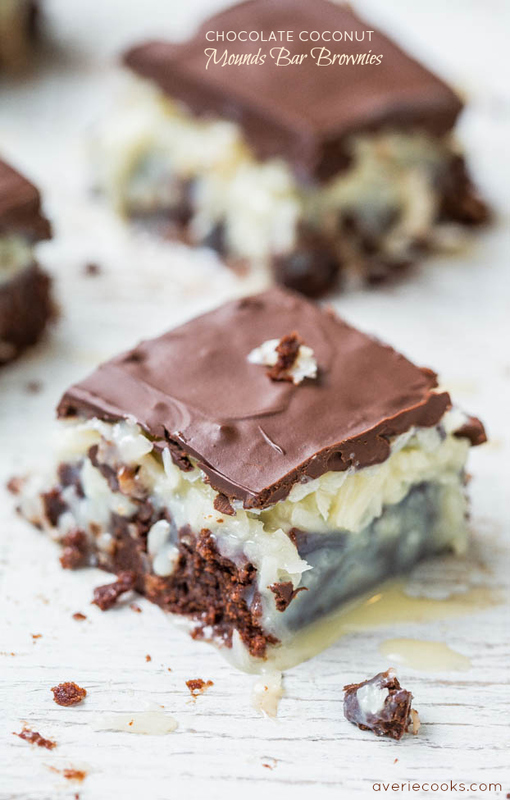 Chocolate Coconut Mounds Bar Brownies – Like eating a Mounds candy bar that’s on top of rich, fudgy brownies! hello there! so excited to make these for my family for christmas this year!! I plan on making them smaller because there are other cookies in our cookie plate — do you have a suggestion for a change in the baking time? thanks! Baking time is size dependent so just keep an eye on them depending how small you go…coconut burns fast and you don’t want that. 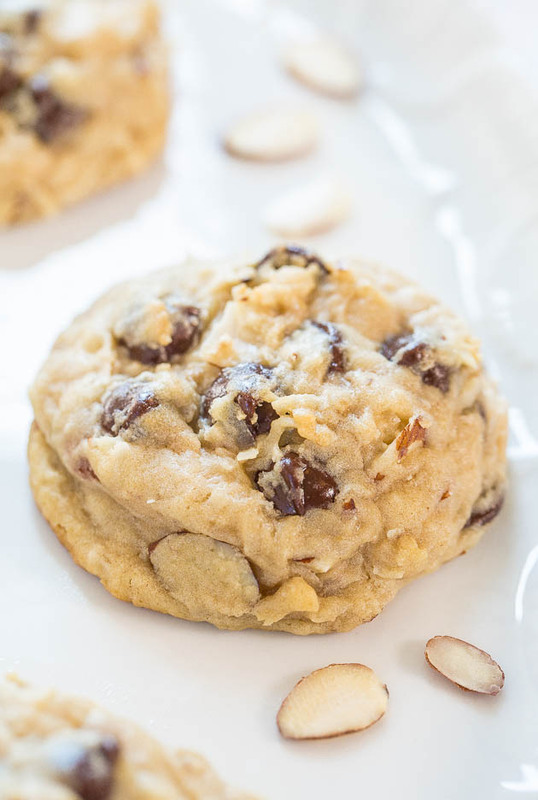 I love this cookie recipe, but I’m confused on the almonds. Your recipe shows slivered almonds, but he pictures show sliced almonds. Which is correct? Have you ever toasted the almonds before you put them in the batter for extra flavor? EXCELLENT cookies! Yes I have toasted them before I put them the cookies. You can use either type of almond – slivered or sliced. Hi, just reading the recipe I’m salivating! But wanted to point out that in one part you mention using “sliced” almonds but in the Ingredients list you you list “slivered” almonds. I used ingredient list but think “sliced” would be better. FIscher makes both! You can use either sliced or slivered. These are delish. The I didn’t have the Almond or the coconut extract. So I just used plain vanilla extract. I also added a half cup of marshmallows to give it more of a gooey flavor and resemble an Almond Joy Bar. They were a hit with my brother and children, waiting for my husband to try some. Thanks. Next time I’m at the store I’ll try to grab almond or coconut extract and see if they taste even better. Thanks for the five star review and I’m glad they were a hit! LOVE THESE COOKIES! I adore coconut anything but these delicious cookies are absolutely like the Almond Joy candy- if not better. Every time I make them they are gone the same day. The recipe is truly spot on! Easy to make, deliciously yummy, and super coconutty- you can’t go wrong! Thank you so much for the great recipe! Thanks for the 5 star review and glad you love these so much and that the recipe is truly spot on for you!